CHICAGO (WLS) -- ABC 7 celebrates St. Patrick's Day with LIVE, parade broadcast Saturday, March 11, 2017 at Noon. ABC 7 celebrates St. Patrick?s Day with a live parade broadcast. ABC 7 Feature Reporter Frank Mathie Celebrates 50 Years of Broadcasting in Chicago! ABC 7 celebrates St. Patrick's Day with a live parade broadcast. Everyone's Irish on St. Patrick's Day -- and ABC 7 Chicago will kick off this grand Chicago tradition with a 2-hour parade special. The 34th annual LIVE broadcast of the St. Patrick's Day Parade will air on ABC 7 from Noon to 2 PM on Saturday, March 11, 2017. ABC 7 Eyewitness News Anchor Alan Krashesky, former ABC 7 Anchor Joel Daly and Midwest Director of the American Ireland Fund, Roseann Finnegan LeFevour, will team up to host the coverage of bagpipers, Irish Step dancers, floats, marching bands and marching politicians that make this one of the most celebrated events in Chicago each year. ABC 7's Janet Davies and Frank Mathie will be reporting all the excitement and pageantry on the street. Frank Mathie will be celebrated during the parade with a look back at some great moments in his illustrious 50 year career. ABC 7 Chicago will also highlight "50 Years of Frank" during newscasts from March 27-April 3. Frank began broadcasting in Chicago at WBKB-TV, later renamed WLS-TV, on April 3, 1967. He chose April 3 as the perfect date to sign off from ABC 7 and commented that he's a lucky guy for the experience of working at the station for five decades. During his tenure at ABC 7 Frank said, "I'm a proud Irishman, and I can't recall ever missing a chance to be part of ABC 7's St. Patrick's Day parade broadcasts since the first time the station aired the parade!" Once again this year, ABC 7 Chicago's float will be a big attraction. Members of the ABC 7 Eyewitness team including Ravi Baichwal, Tracy Butler, Michelle Gallardo, John Garcia, Eric Horng, Liz Nagy and Dionne Miller and are scheduled to be part of the St. Patrick's Day Parade tradition. The 2017 St. Patrick's Day Parade Grand Marshal will be Martin J. Healy, Jr, first generation Irish and founding partner of Healy Scanlon Law Firm of Chicago. Healy grew up in Chicago's West Side, from Resurrection Parish, and graduated from Notre Dame University and Loyola University School of Law. Thousands of marchers, parade units, marching bands, floats, horses and a few leprechauns will be featured as the parade proceeds from Balbo Drive, north on Columbus Drive to Monroe Street. Always a must-see in the parade, the Shannon Rovers bagpipers bring a touch of Ireland to Chicago as they have for the past 91 years. Maura Elizabeth Connors, from Chicago's Beverly neighborhood, was crowned the 2017 St. Patrick's Day Parade Queen. She is a graduate of Chicago's St. Ignatius College Prep and the University of Chicago. She really loves Chicago and being of Irish descent has always been part of our family," her mother, Caroline Connors, said. 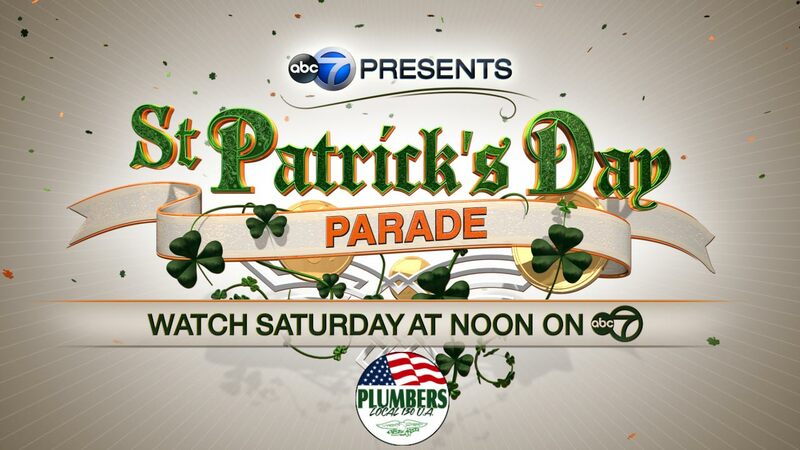 The St. Patrick's Day Parade will be streamed live on abc7chicago.com and the ABC 7 News App. It will be available on-demand after the event on abc7chicago.com.